December 2, 2009 - A Boeing and a Raytheon employee complete installation of an APY-10 radar antenna on P-8A Poseidon test aircraft T2 last month at the Boeing Developmental Center in Seattle. T2 is the P-8A program's primary mission system test article. Following completion of the next phase of radar installation and additional instrumentation, T2 will enter the U.S. Navy's flight test program in early 2010. During flight test, Navy and Boeing pilots will verify the performance of all aircraft sensors. The P-8A radar antenna was developed and delivered by Raytheon. Boeing's industry team is building and testing five anti-submarine warfare, anti-surface warfare, intelligence, surveillance and reconnaissance aircraft as part of a System Development and Demonstration contract awarded in 2004. The P-8A Poseidon is a long-range anti-submarine warfare, anti-surface warfare, intelligence, surveillance and reconnaissance aircraft capable of broad-area, maritime and littoral operations. A derivative of the Next-Generation 737-800, the P-8A combines superior performance and reliability with an advanced mission system that ensures maximum interoperability in the future battle space. 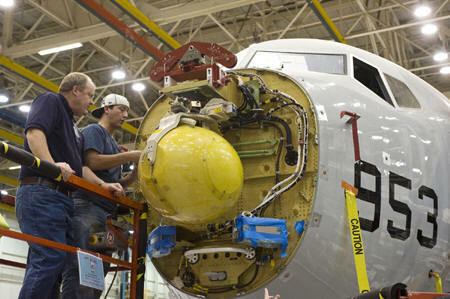 The P-8A is being developed for the U.S. Navy by a Boeing-led industry team that consists of CFM International, Northrop Grumman, Raytheon, GE Aviation and Spirit AeroSystems. The U.S. Navy plans to purchase 108 P-8As to replace its fleet of P-3C aircraft. The first aircraft will begin formal flight test in 2009 and initial operational capability is slated for 2013. On Jan. 1, 2009 Boeing signed a contract with the Government of India to provide eight P-8I long-range maritime reconnaissance and anti-submarine warfare aircraft to the Indian navy. The P-8I is a derivative of the P-8A designed specifically for the Indian navy. Propulsion: Two CFM56-7 engines providing 27,000 pounds thrust each Length: 129.5 feet (39.47 meters) Wing Span: 123.6 feet (37.64 meters) Height: 42.1 feet (12.83 meters) Maximum Takeoff Gross Weight: 187,700 pounds (85,139 kilograms) Speed: 490 knots (564 mi/h, 789 km/h) Range: 1,200+ nautical miles, with 4 hours on station. On April 27, 2009 -- Boeing P-8A Poseidon test aircraft T-1 successfully completed its first flight April 25, taking off from Renton Field at 10:43 a.m. and touching down at Boeing Field in Seattle at 2:14 p.m. The P-8A performed a series of flight checks, reached a maximum altitude of 25,000 feet, and landed after three hours, 31 minutes in the air. "This is a significant accomplishment for the P-8A team, as it moves us one step closer to delivering the next maritime patrol and reconnaissance aircraft to the warfighter," said Capt. Mike Moran, P-8A program manager for the U.S. Navy. "Today's flight is a clear demonstration of the program's commitment to delivering this critical capability on time and the result of a tremendous effort by the joint Navy/Boeing team. I commend Boeing for putting its 'A-Team' in place on this program and enabling the Navy to leverage Boeing's experience, expertise and, more importantly, dedication to make this aircraft a reality." Prior to takeoff, the P-8A team completed a limited series of flight checks, including engine starts and shutdowns. During the flight, test pilots performed airborne systems checks including engine accelerations and decelerations, autopilot flight modes, and auxiliary power unit shutdowns and starts. "This is an exciting day for the P-8A program and a tribute to the hard work of the entire team," said Bob Feldmann, Boeing vice president and P-8 program manager. "We understand the needs of the U.S. Navy and maritime patrol community, and we are dedicated to meeting every one of our future milestones on or ahead of plan." The integrated Navy/Boeing team will begin formal flight testing of the P-8A during the third quarter of this year. Before that, Boeing will paint the aircraft, install additional flight test instrumentation and conduct a series of ground tests. The P-8A, a derivative of the Next-Generation 737-800, is built by a Boeing-led industry team that includes CFM International, Northrop Grumman, Raytheon, Spirit AeroSystems and GE Aviation. The team currently is assembling and testing the first five P-8As. The Navy plans to purchase 108 P-8As to replace its fleet of P-3C aircraft. Initial operational capability is planned for 2013.